Trends in monthly heavy precipitation, defined by a return period of one year, are assessed for statistical significance in observations and Global Climate Model (GCM) simulations over the contiguous United States using Monte Carlo non-parametric and parametric bootstrapping techniques. The results from the two Monte Carlo approaches are found to be similar to each other, and also to the traditional non-parametric Kendall’s τ test, implying the robustness of the approach. Two different observational data-sets are employed to test for trends in monthly heavy precipitation and are found to exhibit consistent results. Both data-sets demonstrate upward trends, one of which is found to be statistically significant at the 95% confidence level. Upward trends similar to observations are observed in some climate model simulations of the twentieth century, but their statistical significance is marginal. For projections of the twenty-first century, a statistically significant upwards trend is observed in most of the climate models analyzed. The change in the simulated precipitation variance appears to be more important in the twenty-first century projections than changes in the mean precipitation. 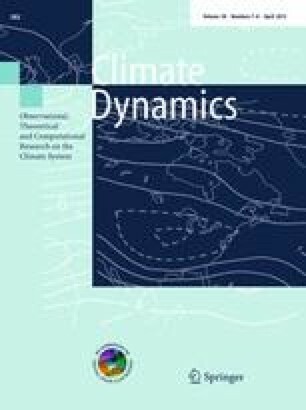 Stochastic fluctuations of the climate-system are found to be dominate monthly heavy precipitation as some GCM simulations show a downwards trend even in the twenty-first century projections when the greenhouse gas forcings are strong. S.M. and G.R.N. wish to gratefully acknowledge partial support from a NOAA grant whose P.I. is Professor S. S. P. Shen. In addition, S.M. wishes to thank Mr. H. J. Haynes whose endowment provided support. This research also received some support from an NSF/CMG grant ATM-0620624. M.G.G.’s research was partially supported by NSF grant DMS-1007504 and by Award No. KUSC1-016-04 made by King Abdullah University of Science and Technology (KAUST). We acknowledge the modeling groups for making their model output available as part of the WCRP’s CMIP3 multi-model dataset, the Program for Climate Model Diagnosis and Inter-comparison (PCMDI) for collecting and archiving this data, and the WCRP’s Working Group on Coupled Modeling (WGCM) for organizing the model data analysis activity. The WCRP CMIP3 multi-model dataset is supported by the Office of Science, US Department of Energy.